Not every election is won on 'Time for Change'. Right now over at LegionElection.com you can take part in the age old DC custom of fan's picking the next leader of the Legion Of Super-Heroes via an online poll. 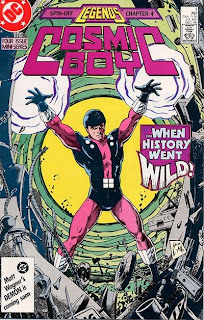 While Dawnstar offers a serious and deserving threat, for my money the winner has to be Cosmic Boy. Sure there's that notion of Cos' having been the big cheese and it's time for someone with a different flavour, but I'm picking we haven't seen the best from the Legion's magnetic man - that there's more to come yet. Where does your 20 cents lie? Head over to LegionElection.com to choose who writer Paul Levitz will have to script around, and literally help write the future. I don't why, but I love it when a comic I own shows up on a blog. I suppose it makes me feel connected in some special way. I agree with you, I believe wholeheartedly it will be Cosmic Boy. If someone else does happen to win, Cos will come back as leader eventually, due to some kind of disaster. No one else can lead that thoroughly unwiedly crew as well as he can. And, quite frankly, I'd be disappointed to see someone else try and be successful. I like Cos too much. Always good having another Legion fan in the house Randomnerd - especially a Cosmic Boy one at that! Everyone has that title they used to draw or write up fan scripts for and for me it was the Legion. I still think they are DC's most overlooked bit of cool and hopefully one Warners has big things in mind for! The last Legion election was such a washout - we were discussing it in one of our previous APAs and were dumbfounded at how Mon-El [whos hardly ever in the group, preferring to roam space] could beat the lovely, fragrant Tinya [Phantom Girl] to claim the leadership. All the votes, both postal and online stated beforehand that PG would win outright, yet at the last minute Levitz was 'asked' by the TPTB to change it to Mon-El. One clear ezample of rushed writing was the scene in the Mission Monitor Board room in the issue the leader was declared, in which Phantom Girl and Cosmic Boy were observing something on a screen; the dialogue was altered so Tinya wasnt asking/ordering Cos to do whatever, yet the scene still showed her observing behind him...an odd scene. Im still fuming she didnt become Legion leader! She wouldve been excellent. Everyone loves Tinya!